By John F. McKenna (McJack): It was reported today in the Philippine Inquirer that HBO is in the running to show the November 12 fight between Manny Pacquiao (53-3-2, 38 KO’s) and Juan Manuel Marquez (52-5-1, 38 KO’s). Showtime still has the inside track, but it is thought that HBO will put in a solid bid for the fight. Any Pacquiao fight, regardless of the opponent is a guaranteed blockbuster, as evidenced by “Pacman’s” May 7 clash with Shane Mosley which brought in substantial PPV buys even though that fight was perceived by boxing fans right from the outset to be a mismatch. 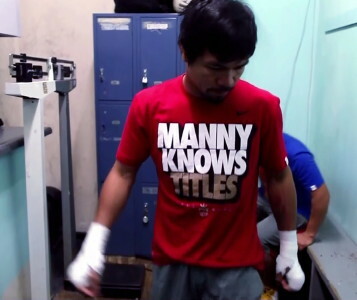 The Pacquiao – Mosley fight brought in a lofty 1.3 million PPV buys, worth about 71 million dollars for Showtime. Showtime was given the broadcast rights for that fight over HBO by Top Rank promoter Bob Arum. It is thought that Arum chose Showtime because of its much larger fan base and also to showcase Manny Pacquiao’s talents to the casual boxing fan. Top Rank chief Bob Arum will be meeting with Showtime today to receive their initial offer. If CBS throws its full support behind Showtime in this endeavor, HBO will have to be very persuasive and shell out more money to reclaim the broadcast rights. Pacquiao’s fights have averaged over one million PPV buys for HBO. His fight with De La Hoya brought in 1.25 million buys, Ricky Hatton (850,000), Miguel Cotto (1.25 million), Joshua Clottey (700,000) and Antonio Margarito (1.25 million). Showtime showed a larger viewer base than HBO after Pacquiao’s fight with Mosley exceeded the figures for his HBO fights. Bob Arum is in the enviable position of being in a bidding war between Showtime and HBO and it is a war he cannot lose. He is also hoping that through mainstreaming Pacquiao on Showtime that his popularity will only increase making him even more marketable for future fights. A Pacquiao fight against an opponent who has a realistic chance at defeating him will put the PPV buys through the roof.